I've made a new "House Results Widget", and, full disclosure, it is making me insanely optimistic for the election this November. The Results Widget is my version of the infamous "needle." In essence, it takes in all of the information we have at any given point (right now, just history and polls) and turns it into an estimate for what is going to happen to the US House when the dust settles. And at this point, I'm predicting a better than 90% chance that the Dems take control. I'll write a technical post shortly about why that should be, but for now, just enjoy randomizing the universe by pressing the reload button and looking at predictions for your favorite district. As a baseline, most districts are going to be something like their historical trends. I start with the average of the 2012 and 2016 presidential results in each district, with the national average subtracted to give a "neutral" prediction. Polls of individual Congressional Districts are super useful. I know, I know, "The polls were all wrong in 2016" -- except they weren't*. My model uses all public polling, and compares how much better or worse a district is performing compared to the baseline. Then I allow the possibility that it's all gone to hell, and that something like 2016 might happen. For that, I allow the possibility that all polls are off by about 3 points or so in either direction. A generic bump across the board. That's it. I take the polls, find the best fit to the 3 numbers above, and that's the model. I then simulate a few thousand times (historical data suggests that quality of candidates, and details of a district can cause things to bounce around an ideal model by about 8%). For each realization, I have a House map. I can then make predictions in two ways. 1) A simple "winner take all" prediction (where every district where a candidate has more than 50% is given to them), and 2) A distribution of possibilities (the bell curve in the image at the top), where the outcomes are correlated. For my polls, I use every B- or better pollster (according to 538) from the last 60 days, and by default exclude internal polls. And what does it predict? 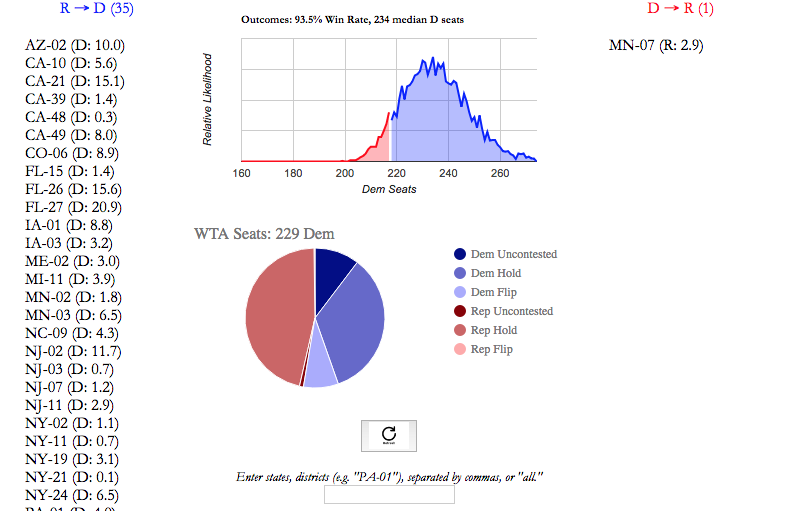 In the WTA model, Dems win about 233 seats (218 are required for a majority). In the simulations, Dems win the House 97% of the time. In the simulations, Dems win a median of 240 seats. So, for instance this uses the same incumbency advantage as in 2016, and assumes that the somewhat more modest generic ballot at 538 (8%) are correct, and predicts only a 62% win probability. On the other hand this only looks at polls over the last month, but assumes a much wider range in polling misses (5% -- remember, that would be on average. 2016, which was supposed to be a horrible mistake was only ~3% off at the statewide level). Supposing the polls nail it (1% in the average of errors -- and this also assumes nothing changes between now and election day, not something supported by history), Dems win ~100% of the time. Point is, I've loaded it with reasonable, but not unimpeachable assumptions. Play around and give me your thoughts. * 538 took a look at the polling misses and crunching the numbers, the average state polling error in 2016 was about 3% -- roughly on par with the 2 point swing that other studies found in the last 2 weeks of the 2016 election (thanks, Comey). 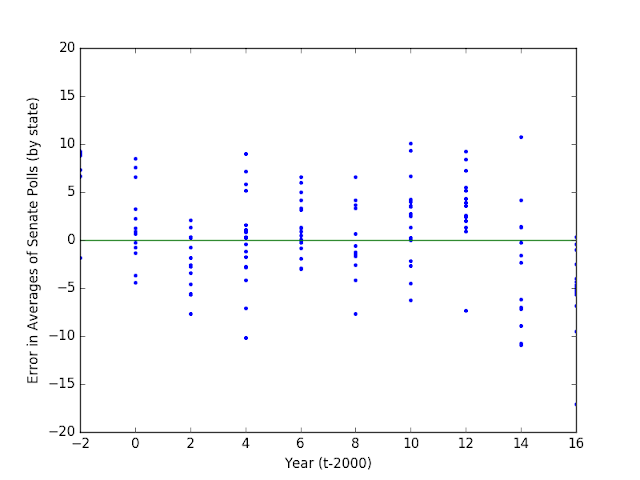 This is a systematic error, and we can't predict it. For all we know, this year's congressional races will produce a systematic error toward the Dems. 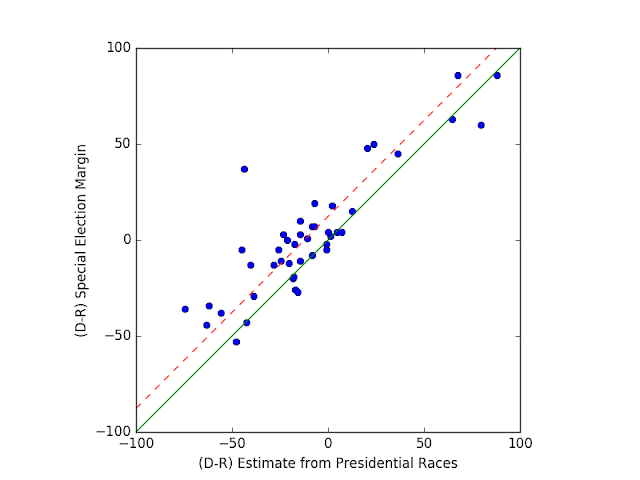 However, the model assumes that a typical range of systematic errors is about 3 points, and therefore that the 2016 election miss was on the high end. ** But think about it. What is a generic candidate? You vote for a specific person in a specific district. Asking about that is a much better way to get at the real predictive information.